Proc No 3215 TSSA Hyderabad-UDISE 2015-16 Communication of Schedule for data capture at various levels and instructios to follow while capturing data. 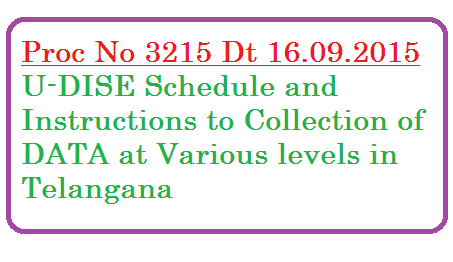 Telangana SSA has issued guidlines on UDISE 2015-16 to officials at different levels. The guidlines for collection of data for UDISE 2015-16 to the field level functioneries i.e., Dy.EOs/MEOs/CRPs/Principals/Headmasters.